One of motorcycling greatest allures is the special way that we are moved. This kind of movement with its freedoms and sensorial delights is very rare in life. Some say that it’s close to a dreamlike state of flying or falling or being thrown. Getting propelled by an invisible force keeps us coming back for more. The last time I was this excited about the sensory experience of riding was 33 years ago when I turned a throttle for the first time and launched myself through time and space faster than ever before. Freed from corporeal concerns, untethered from mortal bonds, I flew. This time it’s the ZERO DS. The DS stands for Dual Sport, not for the small handheld video game my kids keep asking for. This two-wheeled DS is also fully electric. Black with red accents, the DS looks sharp up close and from a distance. From the front it looks like any Dual Sport bike. People who are into bikes kept looking at it, trying to figure out what it was. They would look at the spot where the motor was, then to the rest of the bike and then back to the motor area thoroughly confused. 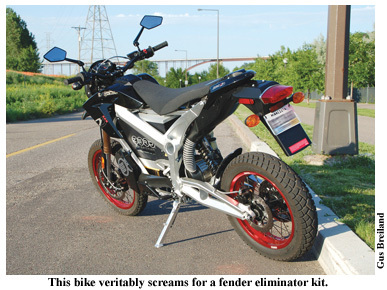 While the bike veritably screams for a fender eliminator kit, the styling has much to do with the packaging considerations specific to electric motorcycles. Gone are the century-old design concerns relating to radiators, transmissions and gas tanks replaced with concerns about where to place the heavy battery pack, cooling for the electric motor and the location of the extra electronics. Whether you like the style or not, it is executed very well. Effective use of materials and very nice surface finishes abound on the bike, from the trick anodization to the textured paint, the ZERO conveys a very modern image. And well it should because it is about as modern as modern gets. The DS is so modern it is the future. The ZERO’s ergonomics are classic Dual Sport. When you sit on the DS, you are up high, back straight, with no part of the bike in your vision. No front fender, no tank, no shield; nothing to crush the illusion that you are flying. Once in motion, the leverage imparted by the wide dirt bike bars make the bike feel even lighter than its 297-lb curb weight. Unless you get the optional 33.8-in low seat height, you are solidly in nosebleed dirt bike seat height territory at 35.8-in. The seat is on the very firm side and is very narrow, pure dirt bike. This doesn’t much matter, as you never ride the bike that many miles in a row. All of the controls are typical modern motorcycle switchgear with a very solid feeling of quality. 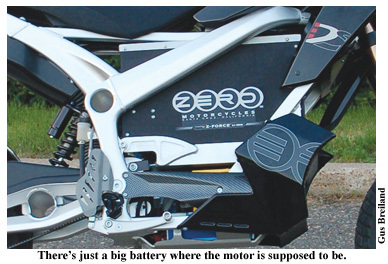 The 4.4 kWh lithium-ion battery pack is located where the engine would traditionally be and the cantaloupe-sized, permanent magnet, forced air-cooled DC motor is mounted low, near the swingarm pivot. Those of a certain age may be suspicious about rechargeable batteries. This is understandable with the unreliable nature; weak power levels and charging/discharging patterns of early rechargeable batteries and devices. Luckily it is no longer applicable to today’s technologies. The battery monitoring system makes sure that each battery cell is precisely and individually controlled during charge and discharge. This lets ZERO claim 70,000 miles as the average battery pack life. The charger couldn’t be easier to use. Take the supplied cord, which looks suspiciously like a computer power cord, plug one end into the bike and the other end into the wall. Then wait. Zero claims approximately four hours to full charge. The lights on the battery go from yellow to green when done charging. Power supply can be either normal wall 110-volt or upgraded 220 volt. ZERO has a quick-charge option available that cuts charging time by half. Once fully-charged, turn the key, the gauge pack does its start dance, flip kill switch to run and the ONLY thing that happens is that that a green light on the dash goes on. That’s it. No noise, no vibration, no smell. The only way to mentally prepare for this bizarre absence of sensation is to have previous experience in a hybrid car. Unfettered from the noise and vibration of an internal combustion engine, you realize that you are locked and loaded, its running. Roll on the quarter-turn throttle. 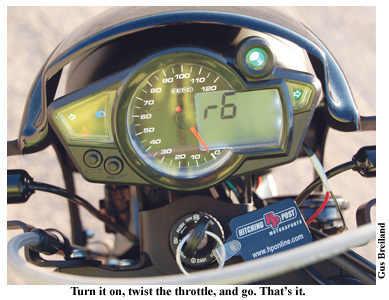 Throttle tip in/response is a progressive gentleness. It feels like doing a super-smooth, long, slow clutch slip engagement to get going. So slow that on a class-5 gravel road from a dead stop to instant, WFO throttle, the DS didn’t even disturb a single rock. This is the science of the motor controller. The motor control program dictates how aggressive the power delivery is going to feel to the rider. The dirt bike models from the ZERO line have a switch that lets you pick a less or more aggressive throttle program. The DS is non adjustable. Hackers may be the tuners of the future. Throttle roll off feels markedly different on the DS too. At low speeds you can feel the rotation of the motor commutator through the toothed drive belt. At higher speeds, there is little engine braking as there isn’t a whole bunch of reciprocating mass whirling about. Not better or worse, just different. The right wrist just needs to recalibrate. From a standing start, full throttle acceleration feels like riding a 125cc conventional motorcycle to about 35mph. By 45 to 50mph the ZERO pulls hard enough to get all of your attention; akin to a 250cc conventional bike near redline. On the class 5, the DS lit up the rear tire in a big way at 45 mph- once the mass had gotten rolling. Head down sideways, flat on the tank and exhaling, delivered an indicated 71 mph. In an urban environment, the DS is plenty fast. From 0 mph to kissing 60 mph and then back down to 0mph was possible in one city block. This is partly due to the fact that the electric motorcycle is so quiet. Not like the quiet from the quiet baffle in your pipe, but quiet like no appreciable noise. From a standstill, there is no noise, then very slight tire noise up to about 15 mph, and then wind noise obscures all other noises. No loud pipes to save your lives. And your life might need saving if you come flying up behind old people or mothers with children at high speeds that would have been given away many hundreds of feet before with an I.C.E. motor. Pedestrians going parallel to your direction of travel are generally not aware of your presence till you have entered the outer edge of their peripheral vision. 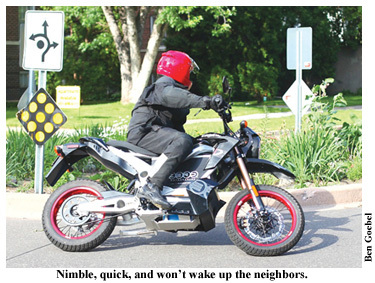 It is extremely easy to scare pedestrians on an electric motorcycle. Another bit of electric motorcycle strangeness is coming to a stop. First the wind and then the tire noise fade, and then you hear birds chirping, breeze blowing in the trees, kids playing, people talking and traffic noise. Sometimes you will hear the electric cooling fan come on. Once I came to a stop and had a major panic attack because I thought the bike had cut out and was broken. After a lifetime of I.C.E. and its feedback of attendant stimuli, there is definitely an acclimation period. Like all new riders of electric motorcycles, I kept grabbing for the non-existent clutch. Along with the unnecessary hand motions, the purity of the experience had me doing phantom foot motions of trying to stab the shift lever in a normal down shifting scenario such as coming up behind slower traffic or coming to a stop. To not use the clutch and shift lever is just weird. Especially since the ZERO is a real motorcycle in every other respect. Coming to a stop is sur-really simple. Just use the brakes and stop. Getting going is just as simple. Turn the throttle and go. Once you get used to JUST braking and throttling it makes a LOT of sense. The DS feels just like any other small dual-purpose bike handling wise. The well spec’ed front and rear suspension offer adjustments for rebound and compression damping. The suspension rates are well picked for a very planted, taut feel. ZERO did everyone a favor by equipping the bike with good brakes. The single, 310mm wave style front disc and 2-piston caliper haul the bike down with enough force to easily overwhelm the dual-purpose front tire. Stock stainless steel brake lines deliver nice feedback to the light pull front lever. ZERO claims maximum range for the DS is 58 miles. I did not try to see how many miles I could eek out of the DS. Fuel economy and range are never the top criteria in my choice of motorcycles. I choose to ride a motorcycle because of its acceleration abilities. From a ‘full tank’ charge state, I rode in an urban setting at either full throttle or no throttle. Every start was pinned, full throttle. Speeds were between 25-50mph. In this full-flog mode, I drained the ‘tank’ in 25 miles. Such aggressive torture testing is all part of our service to you, the reader. No doubt, a different riding strategy would certainly make greater range possible. The question becomes, will the range capabilities match your range needs and riding style? 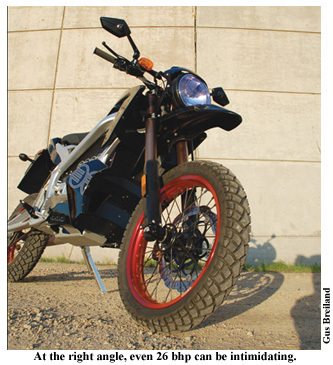 Electric motorcycles are no longer coming; they are here now. 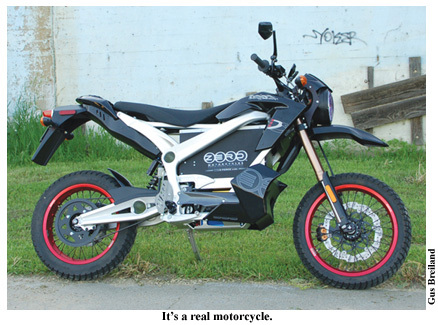 Electric motorcycles are not fad or technical flight of fantasy. They will in many forms be part of our collective motorcycling future. From here on out, with every successive generation, they will only get better in every respect. Racer Chip Yates recently clocked the world’s fastest time for an electric bike on the standing mile in the Mojave Mile speed event: 190.6mph. The new quarter-mile electric motorcycle record is 7.13 seconds at 187 mph set by Shawn Lawless and longtime motorcycle drag racer Larry ‘Spiderman’ McBride on the Rocket electric drag bike. For many, the current range and power levels and performance of the current generation of electric motorcycles leave nothing to be desired. All in a package that is as easy to use as an electric toothbrush. Until we all finally get our silent personal jet packs, one of the purest experiences of moving through time and space has to be the electric motorcycle. The ZERO DS is available to the early adopter exclusively at South Saint Paul Hitching Post. The ZERO line starts at just $7,995. I am 200 yards from my house, uphill, and death has fallen upon me. My heart began to flutter with anticipation and excitement two miles back. Two miles back, I watched as the last bar of my “fuel” gauge went dark. My gas was gone; the only thing keeping my wheels rolling was now empty. What is the bike running on, will? Has it become self-aware? The bike continues to move, silently cutting a path from far to home, but where will this end? Where will my spark go dark? A red light, it is taking precious electrons but what if I turn the bike off? Is there enough spark to “restart” it? Where will I be making my emergency call? Who will rescue me? I needed two miles and 200 yards. I got two miles. A battery-powered motorcycle will bring you as close to this dramatic scene as you most likely will ever experience in your cold, air conditioned office life. A bit over the top you say? In the age of battery-powered everything, one can find just about anything battery-powered. For the most part, you cannot live in this day and age without some form of communication device being powered by a battery and we rely on the little cylinders of stored energy to take pictures, keep time and even save lives. The Zero DS (Dual Sport) is yet another modern convenience powered by a battery. A cute brick of power suspended within a 19-pound frame of aluminum and attached to all the nuts and bolts and other stuff that creates a monster of power for running around town. This thing is excellent for the motorcycle commuter who lives 15 miles or less from their points of interest. While I have seen references to a 58 mile range on a full charge, the reality for this large lad at 6’1” and 275-pounds was about 37 miles total on a full charge. This was at a varying speed of 30 mph to 50 mph. The distance would be less if I were at commuting speeds of 55+ mph. I do think battery power is a brilliant method for getting around town. First off the clutch less direct drive transmission creates twist of the wrist power that takes you from 0-30mph fast enough. The throttle is claimed to be tuned for performance and efficiency at the same time. I would like a bit more performance off the line, as there is a slightly longer delay to get the bike rolling from a stop sign. This quickly turns into 30-40 mph however and can be forgiven. Hooligans without an Electrical Engineering degree to reprogram the bike will be saddened that lofting the front wheel would be damn near impossible. Not that I know how to, but based on the acceleration I can only imagine that getting the front wheel off the ground involves a small coyote, a tall cliff and something labeled Acme. The onboard recharging system is as simple as plugging the bike into your standard house electrical socket. A 4-hour charge brings you back to full power and another 30+ miles of joy give or take your weight and average speed. Oddly, there was no storage for the recharging cable on the bike and the seat does not pop off, so you need to figure out a method for carrying your cable with you if you plan on venturing to far away places like Nordeast or Saint Paul for a quick pancake at Mickey’s. Yea, that’s right, my far away place was a pancake and a cup of coffee. The reality is your employer will not allow you to plug into their electricity unless you work for a small, eco-friendly company. So you need to have a work place that is equal to or less than your maximum charged travel. 30 miles total away from home? The Zero is your bike. Are you 40 miles round trip from home? Then you better be under 170-pounds and not on a freeway. Municipalities are going to have to change over from a parking meter to a recharging station. Another option that is not allowable on this current design would be an interchangeable power source. Imagine being able to remove the battery once you have arrived at your 30-mile away destination like work, only to be able to swap batteries for the one you have been charging over night in your cubicle. This would be an excellent way for this vehicle to become more practical. The benefits of the Zero DS are its slender weight of just under 300 pounds. The tiny footprint makes city commuting a breeze. The quiet ride and power plant create an overall sensation of gliding though life on a battery powered rocket. I love that you cannot hear this bike. The wind noise over my helmet drowned out any tire noise that was generated on my testing rides and when the public did recognize what I was riding, I would be asked if I was leaving soon as they 1) wanted to see me leave and 2) to hear the bike glide away. Not much to hear, but it is something to see. The Zero is made for the city dweller. You have a minimal distance to travel and you don’t venture off too far from your daily routine. This is not for the explorer unless you have a solid network of friends who don’t mind 4-hour random drop-ins for tea and a cup o’ energy. I want to love this bike for all of its glory. I want to love the idea that the battery will allow me to get rid of my oil rich lifestyle. My need for a filling station. Our dependence on that energy behemoth. But it won’t. I work 30 miles from my home and I have only freeway to apply to my commute. This means at average commuting speed, I would expect to run out of charge at about 22-25 miles each way. This makes for a long walk every morning and afternoon, not to mention the extra effort of retrieving the bike to charge it for the next futile ride. As I am pushing the Zero up my alley to get it charging again, I am taken back to the movie. I am taken to the spot where we as a society are living this moment, as only we know how, dramatic without a hint of the actual struggle portrayed in the labored step after step of our hero. I have to get off of this mode of transportation and manually bring my journey to and end. So why didn’t I just peddle? Why didn’t I hop on the bus and use mass transit? Why didn’t I just use some additional fossil fuel and take my regular bike? The reason is I am not ready to give up my dinosaur juice. I am not ready to make the difficult decision of my paycheck over my planet. I am not ready to own a Zero DS, not because of its limitations, but my limitations. 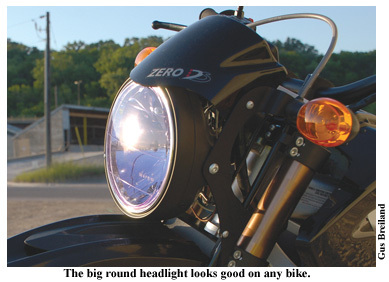 I want to thank Hitching Post South St. Paul for the wonderful opportunity to ride the Zero DS. It is an excellent progression into the world of battery powered bikes and for the right person it is the greatest commuter money can buy. I hope that Zero and any other battery powered vehicle company’s continue to develop their product and refine battery technology so we can get 200+ miles from a charge. The motorcycle needs to continue its legacy of adventure, exploration and practicality. A single vehicle for a single traveler. Currently that battery-powered traveler cannot go much farther than human powered mechanisms like the bicycle. But over time, and with incentive and pure human sprit, the epic book of cross-country travel by battery will be written and it will inspire more invention and exploration. The fractured noise from a loud tailpipe will be replaced with the “whoosh” of a rider cutting through the air and, if you listen closely, you will hear the trailing giggle as the rider pulls back on the grips and begins to hear the silence that is their conveyance, the silence of the Zero DS. Review Sidebar — What’s in a name? In a cultural counterpoint to the loud pipe freedom riders, there is a contingent of alternative-fuel vehicle pilots who pour the green Kool-Aid for anyone and everyone who will listen about their “clean, zero-emission, electric vehicle.” At the risk of being bombarded by recyclable hate mail, we need to set the record straight. It is true that pure electric and hybrid vehicles have zero (electric) or reduced (hybrid) tailpipe emissions. I appreciate this fact, as do my dog, the sunflowers and the wee turtles down in the pond. Let me be perfectly clear about this: electric vehicles are zero-emission “at the tailpipe” of the vehicle. Some people truncate this and erroneously state that the electric vehicle is zero-emission, period. This statement unfortunately is not true. You enjoy a relaxing, quiet commute home on your quiet electric bike or in your electric car. Hmm…Gauge is a bit low. Better top her up for the drive back in tomorrow. After you plugged your bike in, the charging system started to draw electricity through an outlet. The electric company responded to that demand by piping fresh, 60hz juice through the lines and into your home. That electricity was generated by a power plant using hydro, nuclear or (gasp!) coal fuel. And this is the disconnect in the energy supply chain for some well-meaning but mis-informed alternative-fuel vehicle fans. While it is correct to say that your vehicle is zero-emission while underway, electric vehicles as a conveyance are not zero-emission. In our country today, a majority of electric power is produced by burning coal. Yes, dirty, evil coal. This means that unless you are living off the grid and generating your own power as in Mad Max Beyond Thunderdome, your batteries were recharged by electricity generated in large part by the burning of fossil fuels. We make no argument that electric bikes are bad, that coal plants have a bigger carbon footprint than that of a thousand idling cars or that Tab was better than Diet Coke. We merely seek to accurately define a term. In summary, its OK to say, “My electric vehicle is zero-emission when I am operating it.” But remember come recharging time, if you draw electricity from a utility, you are most-likely topping off your batteries with current produced by the emissions-producing burning of fossil fuels.